Come and listen to Rachel Croft’s mesmerizing songs! Rachel Croft mesmerizes us all with her beautiful voice! Let her voice and guitar guide you through her storytelling songs. Just by listening you’ll experience living and busking in the city. She joins us on Sunday 14th of April on the stage. Will we see you there? This musician and songwriter from York finds her inspiration in ethereal Celtic melodies and her own life. Her complex and rich vocals play over a rhythmic fingerpicked guitar. Rachel Croft has built an incredible reputation as one of the finest alternative ethereal folk performers of the UK. She has a following which is unparalleled anywhere else and is regarded as one of the best independent folk and acoustic musicians. Having performed for a number of years as the vocalist in the Croft and Mullen jazz band, notes of soul and the Great American Songbook are instilled in her vocal style. 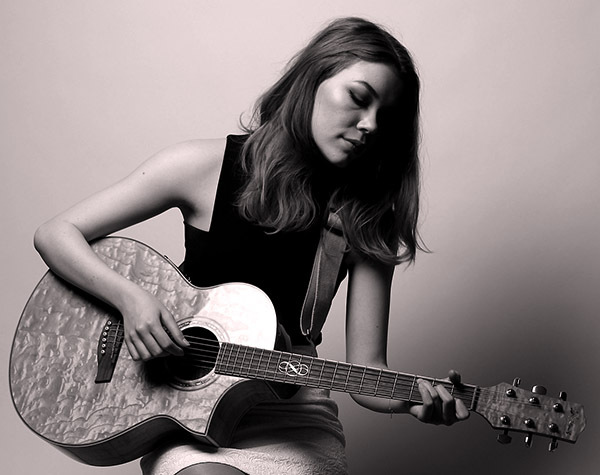 She is influenced greatly by Eva Cassidy, Laura Marling, Joni Mitchell and Matt Corby. But just as well as more contemporary artists such as London Grammar. Having played the main stages of Warwick Folk Week, Bromyard Folk Festival and Beverley Folk Festival among others for her first year on the festival circuit, 2018 showed to be an exciting time for Rachel. Let’s see what 2019 brings! Don’t want to miss Rachel Croft and the rest of our great programme? Make sure you get your tickets for Elfia now!